Graduate of Faculty of Law of the John Paul II Catholic University of Lublin. A Member of the Greater Poland Bar Association since 2013. Attorney Anna Ratajczak concentrates on legal help to service and manufacturing economic operators. She has a long standing experience in legal assistance provided to furniture, windows and doors, and industrial equipment enterprises among SMEs sector. She develops internal rules of legal entrepreneurial organisation, which enables closer relationships between the employee and the employer. 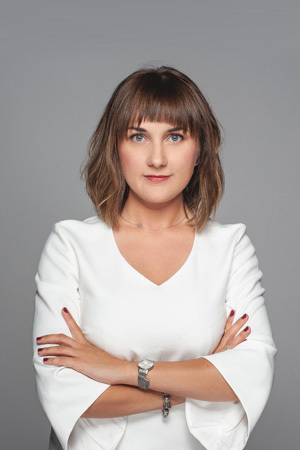 She deals with the legislation of the residence of foreigners in Poland and establishes solutions to legal problems concerning their employment. She analyzes every single legal issue in the most comprehensive possible perspective in order to eliminate future potential problems. She successfully represents our clients in labour disputes. Furthermore, she conducts recovery proceedings at high efficiency level. She also provides an expert legal aid related to personal data protection aspects. What is more, she is the author of numerous safety procedures and policies satisfying GDPR requirements. For her predispositions and interests, she offers help to entrepreneurs in their private legal affairs as well. In this regard she has been appreciated for her involvement and empathy a lot of times. She cooperates with NGO sector (non-government organizations) engaging in pro bono projects. She is capable of working in English.